We have a suggestion if you visit our hometown of Issaquah, Washington. Take your sweet time and visit Boehms Candy Kitchen, a chocolate shop and art museum rolled into one. Above the store is the Edelweiss Chalet, a residence that founder Julius Boehms built in 1956 to house his astonishing collection of art objects and memorabilia. Inside you'll see stained-glass windows from Germany, oil paintings, sculptures and photos from Mr. Boehm's amazing life (he climbed Mt. Rainier when he was 75 and 80!). After viewing the collection, head downstairs to see how Boehms quality chocolates are made. We passed by one machine that was melting over 500 pounds of chocolate–talk about heavenly aromas! We watched candy-makers hand-dipping chocolates, pouring chocolate into molds and coating clusters of nuts with chocolate. Along the way, we saw a 14-pound chocolate turkey and a 65-pound chocolate Santa. Free samples are available at the end of the tour. This is not the place to go if you're on a diet! After the tour, we visited the nearby Luis Trenker Kirch'l, an Alpine chapel Julius dedicated to fallen mountain climbers. It's a replica of a 12th-century chapel near St. Moritz, Switzerland, and the interior is incredibly beautiful. Issaquah is about 20 miles east of Seattle along I-90 (Exit 17). The Candy Kitchen is open from 10 a.m. to 6 p.m. Monday through Saturday and 11 a.m. to 6 p.m. on Sunday. 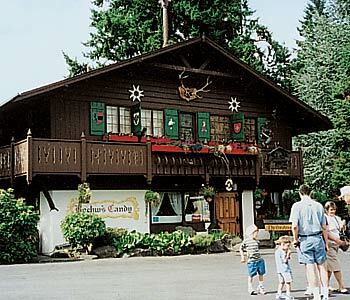 Reservations are required for tours, which run from only June through August (the Edelweiss Chalet is not wheelchair accessible). For details, call 1-425/392-6652 or consult www.boehms.com.